One of the losers in Harley-Davidson ’s decision to move some of its operations from Wisconsin to Europe is Ohio Rep. Jim Renacci. The wealthy Trump surrogate, who is running against Democrat Sen. Sherrod Brown, is one of the richest congressmen on Capitol Hill. Richest! Some of his huge wealth is derived from his investments in Harley-Davidson dealerships as well as numerous other profitable enterprises around the country. When the former Wadsworth mayor first announced his candidacy for governor, he rode a motorcycle, for great “guy thing” optics. He then switched to the Senate race at Trump’s urging. Why ride a bike when you can crawl? 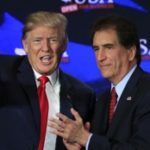 Blessing himself as a savvy, tax-cutting businessman, pro-gun NRA pick of the litter, anti-abortion Christian, Renacci is now saddled (bad pun) with a bike company that is responding to Trump ’s trade war with China. Item: The price of a Harley-Davidson motorcycle, according to early industry estimates, will rise about $2,000. Trump furiously ended his own love affair with the company by accusing it of white-flag surrender and threatening it with “taxes like never before’’. Have a nice day, Jim. You’re in too deep to find a way out of Trump’s swamp.